Magna Graecia is the term used to describe the areas of the Mediterranean beyond the Aegean colonized by the Greeks starting in around 800 b.c. Italy, obviously, is very rich in these places of ancient Greece. The Campania region, alone, of Italy has Neapolis (Naples), Pithecusa (Ischia), Cuma, Poseidonia (Paestum) and Dicaearchia (Pozzuoli) to name from among the best known. 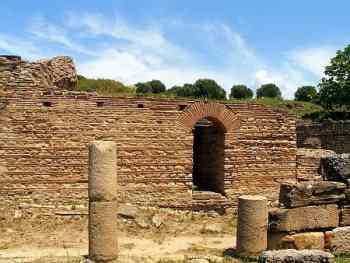 Perhaps the least known of such Greek sites in Campania was founded as Hyele by the Greeks, then changed to Elea and, finally, to the better-known Roman name of Velia. It is along the coast just south of the Gulf of Salerno in the mountainous stretch that leads to the next gulf to the south, the Gulf of Policastro, near the modern town of Ascea and in the Cilento National Park. The site is still sufficiently "away from it all" as to be unblighted by civilization (well, there is the Magna Grecia Hotel about a half-mile away!). The site has been excavated and expertly tagged with explanatory maps and written material by the Archaeological Superintendency of Salerno, Avellino and Benevento such as to make a visit to the site a pleasant stroll through what is essentially an outdoor museum. The city was founded by settlers from Phocaea (modern Foça on the Turkish coast) in about 535 b.c. Greek historian, Herodotus, tells us that the Phocaeacians were fleeing invaders from Persia and first founded Alalia (modern Aleria) on the island of Corsica. As able seafarers and merchants, however, they encountered hostility from Etruscans and Carthaginians in the area who united to drive them away to the southern Italian mainland where they founded their city of Hyele, named for a local source of water, the Yele river. They built their acropolis high on a hill only about 100 meters from and above the sea at the time. (Today, the ancient acropolis is about 700 meters from the sea.) Elea became a major port on the maritime routes between Greece and Italian ports at Cuma and Neapolis as well as other colonies along the Mediterranean coast such as Massalia (Marseille) and Emporion (Ampurias) in Spain, both of which were founded by the same wave of Phocaeacians settlers who built Elea. In the 5th century b.c. the city-state of Elea entered upon somewhat of a "golden age" of learning and culture. The so-called Eleatic school of philosophy is named for the city, and it was the home of Xeno (O, he of the paradoxes!) and the philosopher, Parmenides. (One of the Xeno's paradoxes involves the notion that Achilles can never catch up with a tortoise he is chasing no matter how fast he—Achilles—runs. If you don't understand this, neither did Parmenides. He is said to have asked Xeno, "C'mon. What happens if the turtle slows down?") Also, a renowned medical school grew up and was active for many centuries; the medical teachings are said to have passed down into the Middle Ages to the famous Medical School of Salerno. A century later, Elea was far enough south to resist one of the non-Roman Italic peoples, the Lucanians, of rough Samnite origins; Elea became part of a league of southern Greek cities that successfully held off the Lucanians. Then, around 390 b.c. Elea allied itself with other southern cities in the Italiot League in a war against the Sicilian tyrant, Dionysios I of Syracuse. Later Elea sided with the Romans in the wars with Carthage. Elea eventually became a Roman municipality in 88 b.c., more or less the same fate as everyone else on the Italian peninsula. 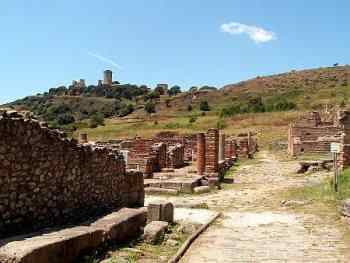 Elea retained the right to keep its own language and coin its own money, but as a Roman town, it was now known as Velia. 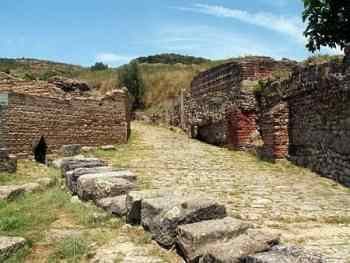 The city was important in the age of Augustus (the first century a.d.) and was well-known as a health spa due to the abundant cold water springs. Thereafter, Velia went into a decline due to new Roman roads that by-passed the area to get to the far south and also due to changing hydrologic conditions—the port started to silt up and the coastline, itself, shifted. Estimates are that only one-fifth of the original city has been uncovered, but enough work has been done to let visitors wander around within the 4.5 km (2.8 mile) perimeter of the ancient wall and up onto the site of the acropolis. Also, modern organizations such as Velia Teatro Filosofia provide presentations, including Greek comedies and tragedies, in the ancient amphitheater in an extensive summer program, now running since 1998. This year's (2009) program also includes a presentation of ancient music entitled, "The archaeology of Lost Sounds." So, if you like paradoxes and quarter-tones, Elea just might be the place for you. As a final note, I must report my disappointment that the famous song from Franz Lehar's The Merry Widow is "Vilja" and not "Velia" as reported in some English translations of the original German text. I was so looking forward to asking Xeno why his city was about to be renamed for a character in a 1905 Viennese operetta. Now that would have been a paradox. The Ancient Greek city of Elea (known to the Romans as Velia), after opening as a museum and an almost unknown archeological site a few years ago (I was the only person on the site when I first went there! ), continues its erudite tributes to the ancients—and is apparently drawing good crowds. They just finished a series of stage presentations under the rubric of Veliateatro, and now follow that with "Plato at the Theater," staged in the amphitheater near the height of the acropolis (photo, top of this page). Each of the four evenings presents in dramatic form, a different aspect of the philosophy of Plato, drawing on the expertise of a number of university professors who will show up and strut their stuff before the crowd--certainly beats a classroom of bored philosophy students. Break some legs, professors!